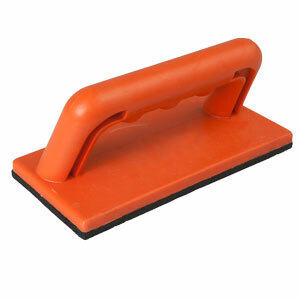 This small push block is made with durable hard plastic handle & base. With it's light wieght and angled handle it makes this push block fit comfortably in your hand while pushing your stock thru your tablesaw or router table with ease. The small Push Block works great with tablesaws, router tables and joiners, but can be used on many of your typical work shop machines as well. Natural rubber friction pads grip the work peace letting you work with confidence, keeping this block between your fingers and the cutting tool. Constructed of day-glo orange high-impact molded plastic. Pad size 3" x 6". 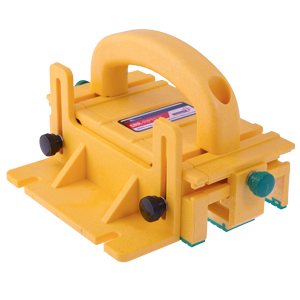 Made of high-impact molded plastic, this safety push block has a layer of friction rubber on the bottom that grabs your work piece as you press down. 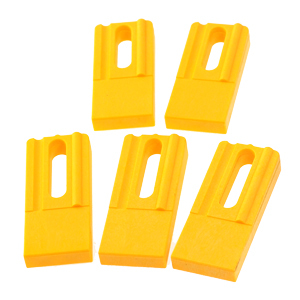 We strongly recommend these for use with jointers, router tables, shapers and table saws. Measures 2-3/4" x 16". 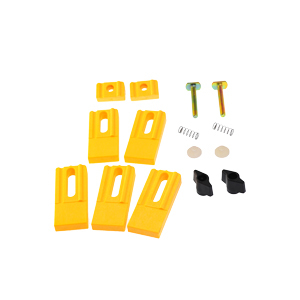 The three piece safety kit includes the 3 most common used push blocks and sticks. All 3 are made with durable hard plastic. 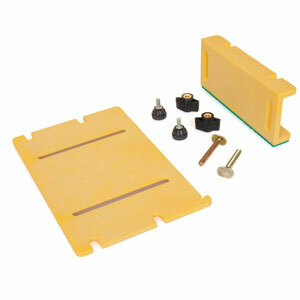 Our brand new push block gives you better control when pushing smaller stock through your router on a table top surface. Made of a composite rubber the pad on the push block is designed grip your stock and provide excellent control while pushing your stock through the router. 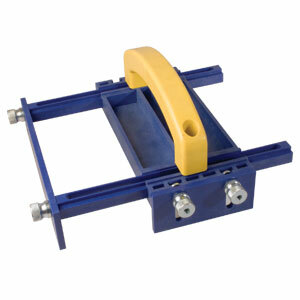 The Power Push Block also has and adjustable platform so you can position the block on top of wider stock pieces. An easy grip handle is completely adjustable side to side for better leverage on smaller pieces. The adjustable arm and the anti-kick back stop firmly hold your stock in place during your cutting process. The GRR-Ripper is not some simple push block. The GRR-Ripper is a unique precision guidance and stock control system designed to feed your wood through your table saw blade with far more safety and accuracy than could ever be possible with bare hands and conventional push blocks. With the GRR-Ripper's 3-directional control, you can safely exert downward, forward, and lateral pressure on the stock for maximum control and safety down to 1/4" cuts. You will enjoy improved accuracy, less wasted materials and a new ease in completing projects. All this is possible with a level of safety far beyond that of simple notched sticks or their bargain-bin substitutes. Best of all, GRR-Ripper's patented design eliminates any need for bare-hand feeding. Rather than acting as a saw guard that is affixed to the back of the table saw, or that hovers above it, the GRR-Ripper not only firmly holds your stock but serves as a movable saw guard, traveling with your hands as a rugged barricade protecting them from the blade. Maximizing the use of your materials no longer has to compromise your safety, and remember too, this safety factor comes with the huge bonus of truly better cuts. Seeing is believing. See GRR-Ripper in action on the video at the top of this page. Note: Use 2 grippers for more control on longer or wider stock keeping both hands out of harms way. The Gripper 200 model is the advanced model. It comes with the same great features as the basic model, plus it includes to advanced accessories that control larger material and thicker stock. First feature is an extra leg that can be used to give you extra gripping power for wider stock pieces and the second features is the large leveling pad. This pad is primarily used to level your Gripper when cutting small, narrow pieces, plus is as an hook on inside corner for extra gripping power. Buy a second Gripper so when you have to cut anything longer than 16 inches you have a second Grr-Ripper on hand so you can "daisy chain" your stock through the cutter or blade in a safe and controlled manner. 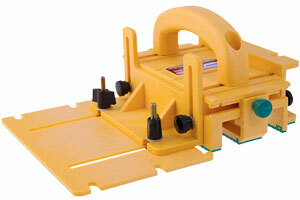 The Gripper is a revolutionary, universal pushing jig for all table saw, router table and jointer users. This is the first tool that grips and holds both sides of work piece during a ripping operation. Unlike a push stick or push block, the Gripper maintains balanced pressure on a work piece as it passes through and beyond the blade. Maintains a parallel, forward direction with the blade while keeping pressure against your rip fence to prevent burning. Eliminates the need to feed stock with your bare hands providing 100% protection. You can cut strips as thin as 1/4" without any special setup so there is no need to throw away those small scrap pieces. The unit can be offset to accommodate small, irregular shaped, pieces on the router table. Includes main body, handle, 1/4" side leg, 1/2" side leg, center leg, adjustable spacer, stabilizing accessory plate, balance support and comprehensive users manual. 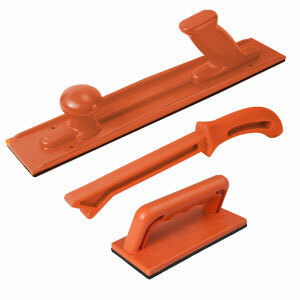 The next evolution in woodworking is here–the versatile GRR-RIP BLOCK Smart Hook Push block. With its popular Green GRR-RIP® non-slip material and smart Gravity Heel technology, GRR-RIP BLOCK increases safety while rewarding you with complete confidence and control over your work piece. GRR-RIP BLOCK's cutting edge technology increases safety and stability when working with jointers, band saws, router tables, shapers and table saws. Upgrade your Gripper® 100 to Gripper® 200 Advanced Model. You love our standard model GRR-Ripper (GR-100), but you're ready for an upgrade. You're ready to take your woodworking to the next level. With the Upgrade kit, you will turn your basic GRR-Ripper to the Advanced Model GRR-Ripper (GR-200). The Advanced Model GRR-Ripper is the ultimate woodshop companion; keeping you safe while giving you the accuracy to produce the exact cut you want. Are you ready for the next level? The Grr-Ripper®, Gravity Heel is a spring loaded lever that attaches to the back of your Grr-Ripper® and provides extra leverage on your stock by dropping down behind the stock to help push it thru your cut. The Grr-Ripper Gravity Heel can also be used on the router table as backing block to prevent blow out for coping operation, stock can be horizontal or vertical (Grr-Ripper lays on its side). The CUT-Through Gravity Heel can be used as a setup template for future use of the same router bit. 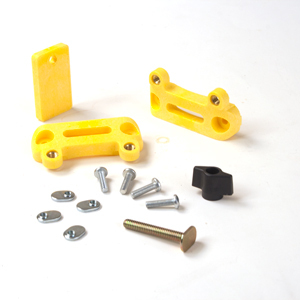 Replacement Heels for the Grr-Ripper® Gravity Heel Kit. Use extra heels for more profiles for your router bits or tablesaw. You can use these heels like a zero clearance for different router bits profile to help prevent blowout on the backside of your cut. With the arch shaped MJ Handle Bridge attached, the downward pressure from the handle is spread across the whole width of the GRR-Riper® body through the FOUR contacting points (two from each bridge) instead of through the two mating points directly under the handle without the bridge. Because of the MJ Bridge Handle enhances the distribution of balanced pressure throughout the GRR-Ripper®, the need of location adjustments of the handle is virtually eliminated. 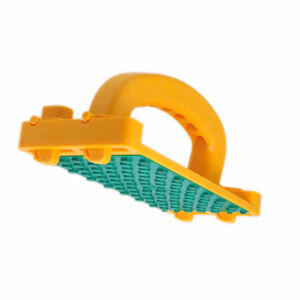 This arch shaped handle will distribute downward pressure to cover entire width of the Grr-Ripper® by 4 contact points. This virtually eliminates the need to adjust the handle on the Grr-Ripper® and significantly improves control by distributing more control throughout the non-slip surface. Also included with the Bridge Set is the Trailing Hook. The easy on/off Trailing Hook allows you to secure your stock even more by dropping behind the work piece to help push your stock thru. Good for thicker stock. 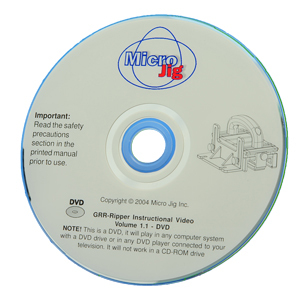 The MJ Deflector/Connector (D/C) is designed to enhance the user experience of the GRR-Ripper® System. The D/C can be used for chip/dust deflection. 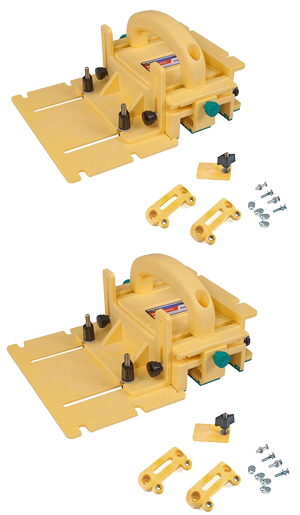 It can also serve as a connecting bridge between two GRR-Rippers®, where it allows for multiple configurations when used on the table saw, router table, and shaper. When the D/C is installed behind a GRR-Ripper®, it also serves as a blade cover when exiting the cut on the table saw. 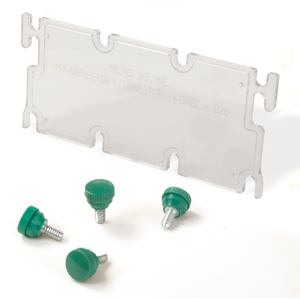 Note: The MJ Handle Bridge Set (Model # GRHB-010) must be installed on your GRR-Ripper® (Model # GR-100 or GR-200) prior to installing the MJ D/C. Note: Gripper images show black Parts that that only come in yellow now. Cutting small pieces on the table saw just got safer, faster and much easier. 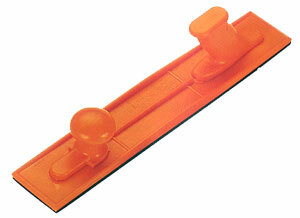 Make consistent and precise accurate 1/8" cuts safely and every time with the GRR-Ripper® without moving the fence. 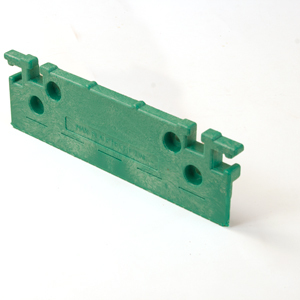 Just remove the the exiting 1/4" leg from the Grr-Ripper® and replace it with the 1/8" leg. Now you can cut those 1/8" strips on the inside of the blade and not have to stop stop to reset the tablesaw fence in those 1/8" increments each cut. This two hour feature-packed video covers over 30 applications of the GRR-Ripper® System on four different machines. The following photo galleries preview the contents in the DVD. For your convenience and ease of navigation, we have created five different galleries to cover each individual professional, each on their own separate page for shorter loading time.